Revere’s offers a full menu with appetizers, burgers, sandwiches & wraps, and delicious entrée items. Every Sunday join us for brunch at 10am to 1pm and enjoy the best bloody mary in town! 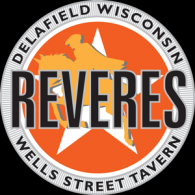 Revere’s is an American Family style tavern with a wide variety of food and an extended beer selection. We are the place to go for a delicious meal & drink with family and friends! For you sports fans we have 11 big screen televisions, regular live music and we offer banquet services for your next big event! Visit Revere’s today!